This summer, in parallel with the Fleurance astronomical festival, the Astro Jeunes 2018 festival was held. It has welcomed more than 220 children from 4 to 16 years old every day to help them discover astronomy and space in a fun and exciting way. This week, the UniversSciel association returns in video on this edition rich in speakers and exciting moments, with which UnivEarthS has joined forces through its contributors. 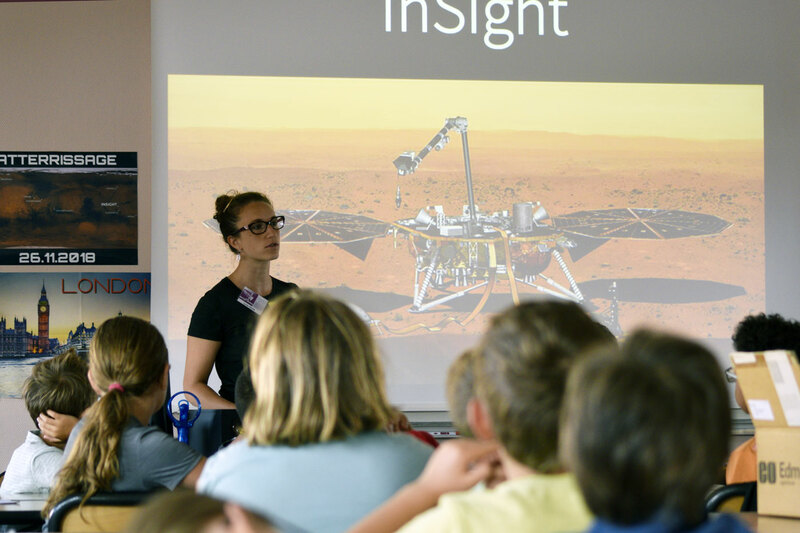 Lucile Fayon, member of the UnivEarthS I3 team: Fundamental Physics and Geophysics in Space, was actively involved in the discovery of the Insight mission, the SEIS project and the issues related to Insight’s upcoming landing on Mars. With Damien Turpin, she has led an exhibition on Insight, virtual reality sessions on Mars and workshops on seismology. Sébastien Rodriguez, from Group I6: From Dust to Planets, was invited as an expert in planetology to talk about the Cassini mission and the latest discoveries made on Titan. This week of discovery traditionally ended with a big celebration and astronomical team games, to win the prizes offered by the partners, to which UnivEarthS contributed to reward the young winners.